In June of 2004, CORSA, the international association of Corvair owners and enthusiasts held their annual convention in Lexington, KY. 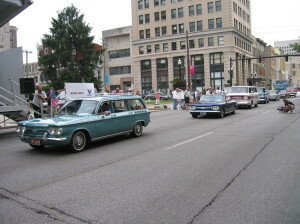 The convention opened with a parade down Main St. Lexington. During the course of the week visitors and Corvair enthusiasts were treated to some scenic back roads in and around Lexington for the road rally and the econorun. Car displays, outdoor vendors and the autocross portion of the convention were held in the Cox St. parking lot behind the host hotel, the Hyatt Regency. I will be adding more stories and images as I collect them. In the meantime, you might enjoy the Promotional Video produced by Jeff Rogers prior to the convention. Take a look at the videos below. The first video is courtesy of Jeff Rogers. The second two videos are courtesy of Scott Szalkowski and were filmed during the convention.